Ohtmpious aren't theonht candidates(ltrezvduation at Coto Research Center. Mike Louis, Louis Publications board chainï¿½ an, undergoes motion analysis while Gideon Ariel supenvises. T rabuco Canyon is postcardbeautiful, the kind of place that gives California its "Golden State' title. The heart of a wreath of rolling hills two hours south of Los Angeles, the canyon is perfect for what it holds: the luxurious Coto de Caza resort, acre-sized homes, Vic Braden's tennis school, rugged sports facilitiesand Gideon Ariel's unique Coto Research Center. Coto Center is the most technologically sophisticated facility anywhere for improving human physical performance by scientific analysis. It has cameras, variable resistance machines, and a computer with unmatched programming. These quantify every component of motion in 16 body segments-muscle contractions, strength, force, speed, velocity, angles, acceleration and deceleration. The results show on the computer screen as a moving stick figure. Ariel analyzes the data, working (or playing) with the stick figure until it moves perfectly according to the goal desired and according to what's best for that individual. Only then is the real person shown how to make the most of his or her motion. The Center analyzes motion in industry, athletics and rehabilitation, but what makes headlines are the dramatic successes of elite athletes, especially Olympians. Founding genius Ariel has a special love for Olympic athletes. He threw the discus for Israel in the 1960 and 1964 Olympics. Since 1971 he has helped the U.S. Olympic Sports Medicine Committee and is chairman of its biomechanics division. Trabuco Canyon is perfect for Ariel's work, partly because of its ideal weather and partly because of Braderi s tennis school, which shares the same spaces. Vic and Gideon are friends and unofficial research partners. home of Ariel's company, Computerized Biomechanical Analysis (CBA), but travelling is worth the effort. "So much of our work is done outdoors, so California is perfect," Ariel explained. "The track, field, swimming pool, tennis court... We always need nice weather." Coto is also near 1984 Olympic headquarters and to the Colorado Olympic training center. 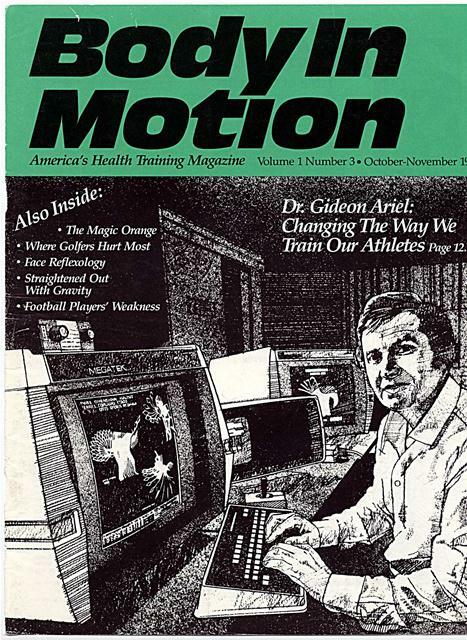 It's becoming more common to put athletes and others through a video and computer analysis of motion, but Ariel did it first. And he does it light years better than anyone. Even critics admit that. Nautilus developer Arthur Jones once snapped at a reporter: "You ask who is Gideon Ariel? I'll tell you... he invented fire... he invented the wheel. .. he invented food. .."
Ariel's fans and friends think the comment is close enough to truth. What Ariel did invent in 1971 were the original principles, complete with working model, of Variable Resistance Training (VRT). He has a patent to prove it, its wording etched in brass and mounted modestly on a wall in his upstairs equipment room. With the VRT development, Ariel went to work helping create the Universal machines, though they (and Cybex and the others) still pale by comparison to his own Ariel 4004-system. 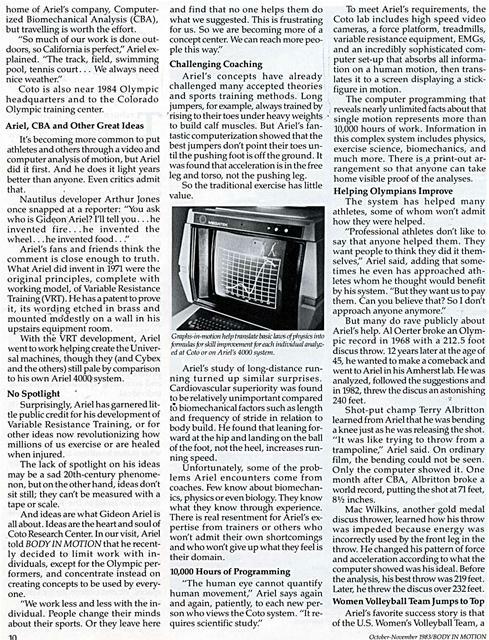 Surprisingly, Ariel has garnered little public credit for his development of Variable Resistance Training, or for other ideas now revolutionizing how millions of us exercise or are healed when injured. The lack of spotlight on his ideas may be a sad 20th-century phenomenon, but on the other hand, ideas don t sit still; they can't be measured with a tape or scale. And ideas are what Gideon Ariel is all about. Ideas are the heart and soul of Coto Research Center. In our visit, Ariel told BODY IN MOTION that he recently decided to limit work with individuals, except for the Olympic performers, and concentrate instead on creating concepts to be used by everyone. and find that no one helps them do what we suggested. This is frustrating for us. So we are becoming more of a concept center. We can reach more people this way." Ariel's concepts have already challenged many accepted theories and sports training methods. Long jumpers, for example, always trained by rising to their toes under heavy weights to build calf muscles. But Ariel's fantastic computerization showed that the best jumpers don't point their toes until the pushing foot is off the ground. It was found that acceleration is in the free leg and torso, not the pushing leg. So the traditional exercise has little value. Graphs-in-motion help tmnslah' lusic lawn of physics into fi,nnulas fir skill impnvement fi)reach indh'idual annlired at Cola or on Ariel's 4(x)0 silstem. Ariel's study of long-distance running turned up similar surprises. Cardiovascular superiority was found to be relatively unimportant compared to biomechanical factors such as length and frequency of stride in relation to body build. He found that leaning forward at the hip and landing on the ball of the foot, not the heel, increases running speed. Unfortunately, some of the problems Ariel encounters come from coaches. Few know about biomechanics, physics or even biology. They know what they know through experience. There is real resentment for Ariel's expertise from trainers or others who won't admit their own shortcomings and who wont give up what they feel is their domain. "The human eye cannot quantify human movement;' Ariel says again and again, patiently, to each new person who views the Coto system. "It requires scientific study." To meet Ariel's requirements, the Coto lab includes high speed video cameras, a force platform, treadmills, variable resistance equipment, EMGs, and an incredibly sophisticated computer set-up that absorbs all information on a human motion, then translates it to a screen displaying a stickfigure in motion. The system has helped many athletes, some of whom won't admit how they were helped. "Professional athletes don't like to say that anyone helped them. They want people to think they did it themselves;' Ariel said, adding that sometimes he even has approached athletes whom he thought would benefit by his system. "But they want us to pay them. Can you believe that? So I don't approach anyone anymore." But many do rave publicly about Ariel's help. Al Oerter broke an Olympic record in 1968 with a 212.5 foot discus throw. 12 years later at the age of 45, he wanted to make a comeback and went to Ariel in his Amherst lab. He was analyzed, followed the suggestions and in 1982, threw the discus an astonishing 240 feet. Mac Wilkins, another gold medal discus thrower, learned how his throw was impeded because energy was incorrectly used by the front leg in the throw. 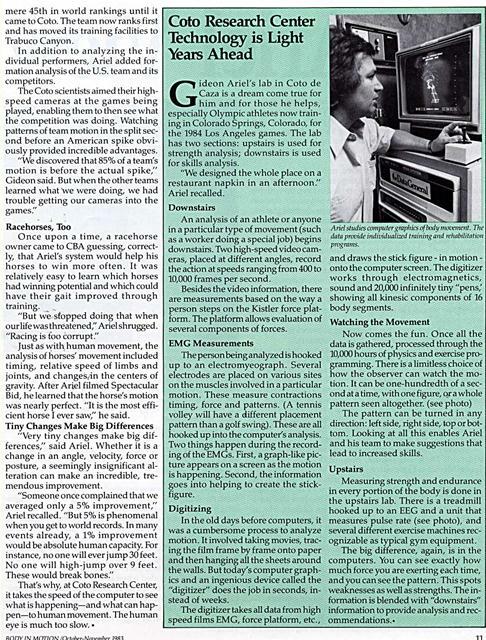 He changed his pattern of force and acceleration according to what the computer showed was his ideal. Before the analysis, his best throw was 219 feet. Later, he threw the discus over 232 feet. mere 45th in world rankings until it came to Coto. The team now ranks first and has moved its training facilities to Trabuco Canyon. In addition to analyzing the individual performers, Ariel added formation analysis of the U.S. team and its competitors. The Coto scientists aimed their highspeed cameras at the games being played, enabling them to then see what the competition was doing. Watching patterns of team motion in the split second before an American spike obviously provided incredible advantages. "We discovered that 85% of a team's motion is before the actual spike," Gideon said. But when the other teams learned what 'we were doing, we had trouble getting our cameras into the games." Once upon a time, a racehorse owner came to CBA guessing, correctly, that Ariel's system would help his horses to win more often. It was relatively easy to learn which horses had winning potential and which could have their gait improved through training. "But we stopped doing that when ourlife was threatened;' Ariel shrugged. "Racing is too corrupt." "Very tiny changes make big differences;' said Ariel. Whether it is a change in an angle, velocity, force or posture, a seemingly insignificant alteration can make an incredible, tremendous improvement. "Someone once complained that we averaged only a 5% improvement;' Ariel recalled. "But 5% is phenomenal when you get to world records. In many events already, a 1% improvement would be absolute human capacity. For instance, no one will ever jump 30 feet. No one will high-jump over 9 feet. These would break bones." That's why, at Coto Research Center, it takes the speed of the computer to see what is happening-and what can happen-to human movement. The human eye is much too slow. G ideon Ariel's lab in Coto de Caza is a dream come true for him and for those he helps, especially Olympic athletes now training in Colorado Springs, Colorado, for the 1984 Los Angeles games. The lab has two sections: upstairs is used for strength analysis; downstairs is used for skills analysis. "We designed the whole place on a restaurant napkin in an afternoon." Ariel recalled. An analysis of an athlete or anyone in a particular type of movement (such as a worker doing a special job) begins downstairs. Two high-speed video cameras, placed at different angles, record the action at speeds ranging from 400 to 10,000 frames per second. Besides the video information, there are measurements based on the way a person steps on the Kistler force platform. The platform allows evaluation of several components of forces. The person being analyzed is hooked up to an electromyeograph. Several electrodes are placed on various sites on the muscles involved in a particular motion. These measure contractions timing, force and patterns. (A tennis volley will have a different placement pattern than a golf swing). These are all hooked up into the computer's analysis. Two things happen during the recording of the EMGs. First, a graph-like picture appears on a screen as the motion is happening. Second, the information goes into helping to create the stickfigure. In the old days before computers, it was a cumbersome process to analyze motion. It involved taking movies, tracing the film frame by frame onto paper and then hanging all the sheets around the walls. But today's computer graphics and an ingenious device called the "digitizer" does the job in seconds, instead of weeks. Ariel st udies computer t r'nhJrir o/bndii nunrnlent. The data prrmide individualized trainin_' and relmhilitation programs. and draws the stick figure - in motion - onto the computer screen. The digitizer works through electromagnetics, sound and 20,000 infinitely tiny "pens; showing all kinesic components of 16 body segments. The pattern can be turned in any direction: left side, right side, top or bottom. Looking at all this enables Ariel and his team to make suggestions that lead to increased skills. Measuring strength and endurance in every portion of the body is done in the upstairs lab. There is a treadmill hooked up to an EEG and a unit that measures pulse rate (see photo), and several different exercise machines recognizable as typical gym equipment. The big difference, again, is in the computers. You can see exactly how much force you are exerting each time, and you can see the pattern. This spots weaknesses as well as strengths. The information is blended with "downstairs" information to provide analysis and recommendations. His white-streaked black mop of hair is usually tousled. His working gear is generally tennis shorts with a Vic Braden (the tennis mentor) patch, a T-shirt that commands "Digitize!" and running shoes. All appropriate ...Gideon Ariel begins his day running five miles up and down the rugged roadways of Trabuco Canyon, and he keeps about that same pace all day long. But no matter how fast he moves, or how fast he speaks (his tongue is as agile as an auctioneer, Israeli accent notwithstanding) Ariel seems hard-pressed to keep up with his own thoughts and ideas. As if trying to physically restrain those ideas, he keeps pushing back his horn-rimmed glasses. The glasses are the only mark of his intense scholarship. Otherwise, he's a warm, friendly man. Big (200 pounds, 6 feet, 1 inch) and unfashionably overenthusiastic about his work particularly with his computers. Gideor s fascination with computers, with what they can and can't do, grows with every new project. "Computers have a perfect memory and they are fast, but they are dumb. Man has a poor memory and is slow... but man is intelligent." So Gideon plays with the computer's joystick the way others play tennis. lie mits, "This is my recreation as well as my work;' he grins, with a shrug. "I like what I'm doing. Why do anything else? I have no family, so there's no conflict. But if there was, I'd just shut off the computers." Sharing his enthusiasm and work-and as close to family as you can get-is Dr. Ann Penny. For 14 years, she has been his dawn running mate, friend, co-dreamer and business partner. Ann is just about as good on the computer joystick as is Gideon, but she's better at the practical end of thingseven answering letters asking for Ariel's help and skills. Ann cheerfully works as Gideon's right arm without recognition. She even laughs off a People magazine story tabbing her as Gideon's "current girlfriend." She sighed, "We've been together for 14 years... not 14 days." Another friend and partner in Ariel's work with Olympic athletes is Dr. Irving Dardik, head of the U.S. Olympics Sports Medicine Committee. They met in 1971. Dardik had been a sprinter and Ariel a discus thrower for Israel in the Olympics. Dardik is a one-man press agent for Ariel's genius. He told BODY IN MOTION: "No one at all has provided a major U.S. effort in sports science, except for Gideon. His incredible genius is his extraordinary research brain. He has an uncanny ability to advance himself into the future of technology and make the future today. He is the key to the whole of technology in biomechanics. Ariel is quantitatively beyond everyone." Well, of course, it wasn't always so glorious. Ariel was born 44 years ago in Israel, grew up in a boarding school near Tel Aviv. Life was spartan. To this day, he despises oatmeal, Ann reveals, although he will eat home-made granola. Friendshipand research goals rtrtite Vic Burden (left) and Gideon Ariel Burden's tennis school and Ariel'snttnrrnertteznluntioncerderslutmNreJncilitiesatTmtntc.Cmn,on, CA. "I didn t win anything, though;' he admitted. "I was too emotional." In 1960,. he also earned his physical education degree at Israel's Wingate (Gideon pronounces it "Vin-gett") institute, a college for athletes. One of his professors was Moishe Feldenkrais. "Then, his course was required. We had to take it. I didn't think too much of it;' Gideon recalled. "But today, I'm beginning to appreciate everything he taught. 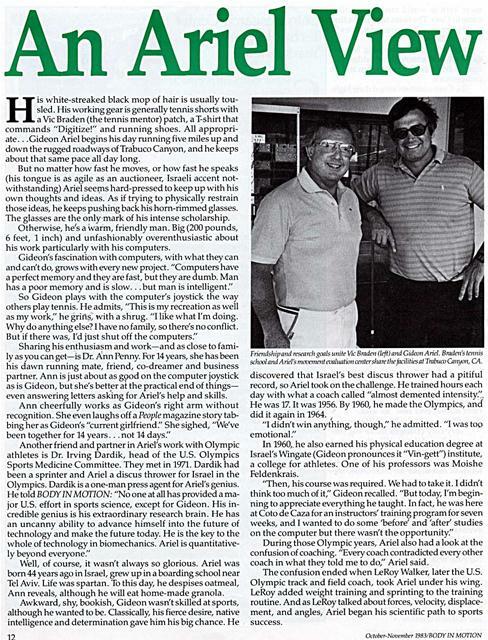 In fact, he was here at Coto de Caza for an instructors' training program for seven weeks, and I wanted to do some 'before' and 'after' studies on the computer but there wasn't the opportunity." During those Olympic years, Ariel also had a look at the confusion of coaching. "Every coach contradicted every other coach in what they told me to do," Ariel said. The confusion ended when LeRoy Walker, later the U.S. Olympic track and field coach, took Ariel under his wing. LeRoy added weight training and sprinting to the training routine. And as LeRoy talked about forces, velocity, displacement, and angles, Ariel began his scientific path to sports success. In time, sports science became the bigger challenge. Gideon moved on to the University of Massachusetts, earning a degree in exercise science in nine months. He met Ann there, and he also got in trouble with the school hierarchy. 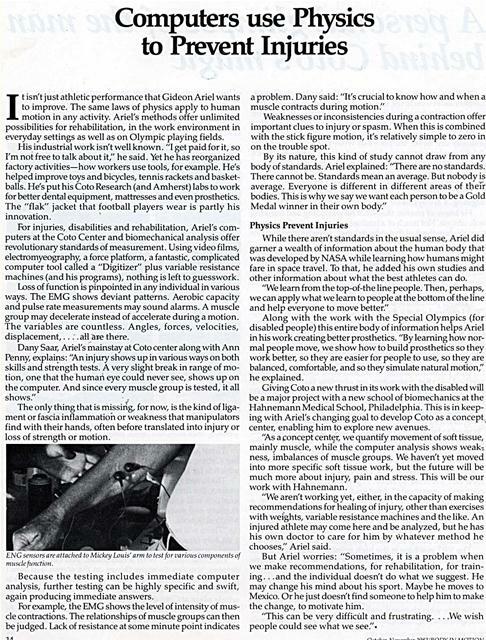 Details are complicated-academia and professional jealousy are never simple-but what happened was that Ariel's student projects of computerizing exercise science suddenly brought him some fame-and money. The school wanted the fame and money, although not entitled to it because Ariel was a student, not an employee. "So I switched to computer science. It was easier than arguing. I always liked computers anyway," he said. He knew, of course, that what he was doing and thinking was unique. Not much of a business man, the conflict served to make him think of that side of things, so he formed his own company. "For just a hundred dollars, you can incorporate, so I did;" he said. 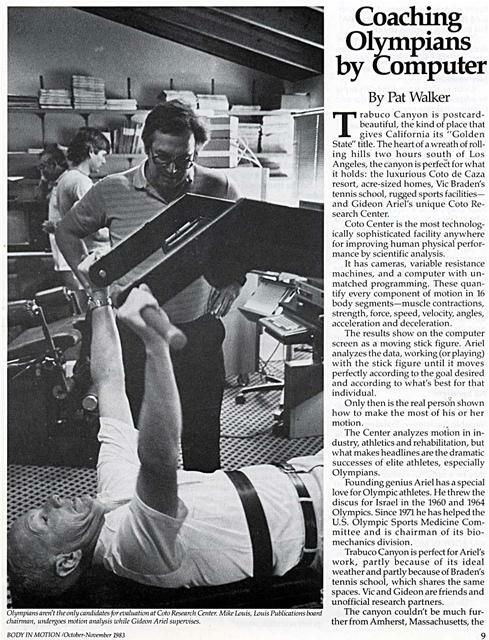 Shop was set up between a Radio Shack and sandwich shop in Amherst, Massachusetts, and the company name was Computerized Biomechanical Analysis, a phrase that is almost a generic term today. "I never planned to do what I'm doing;" Gideon laughed. "But I realized what it could be. Sure, I started making some money, not much, but enough to pay cash for what we buy. I always pay up front. I like to own what I have. It's my Israeli mentality," he half-jokes, adding: "Dun and Bradstreet keep calling me, asking for information. What should I tell them? I have nothing to say. 1 tell them I pay cash." One problem-but also the incentive for the cash-only method-is that. computers are obsolete fast. "Look;' he points out. "This computer is six years old. It cost $60,000 then. Maybe in the '60s it cost a million dollars. Now you can buy better at Radio Shack for $300." This isn't a complaint. Instead, it unleashes excitement. 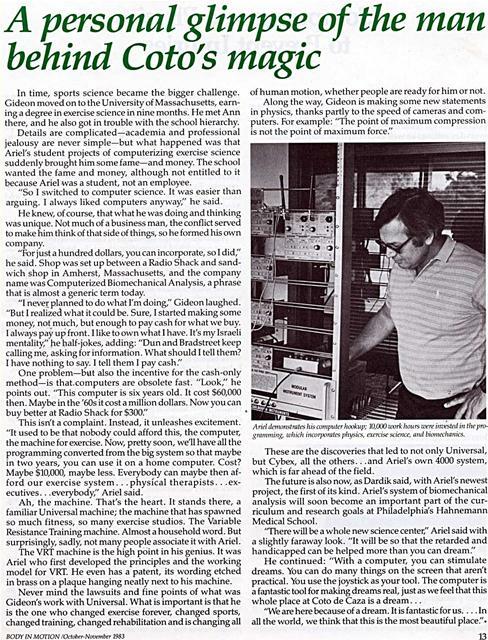 "It used to be that nobody could afford this, the computer, the machine for exercise. Now, pretty soon, we'll have all the programming converted from the big system so that maybe in two years, you can use it on a home computer. Cost? Maybe $10,000, maybe less. Everybody can maybe then afford our exercise system ... physical therapists. . .executives. . .everybody," Ariel said. Ah, the machine. That's the heart. It stands there, a familiar Universal machine; the machine that has spawned so much fitness, so many exercise studios. The Variable Resistance Training machine. Almost a household word. But surprisingly, sadly, not many people associate it with Ariel. The VRT machine is the high point in his genius. It was Ariel who first developed the principles and the working model for VRT. He even has a patent, its wording etched in brass on a plaque hanging neatly next to his machine. of human motion, whether people are ready for him or not. Along the way, Gideon is making some new statements in physics, thanks partly to the speed of cameras and computers. For example: "The point of maximum compression is not the point of maximum force." Arid demonstrates his con:puterho()kup; IO, kX)uvrkhoursWerenwistedintheprolramrnin', which incorporates physics, exercise science, and bionrechan:cs. These are the discoveries that led to not only Universal, but Cybex, all the others.. .and Ariel's own 4000 system, which is far ahead of the field. The future is also now, as Dardik said, with Ariel's newest project, the first of its kind. Ariel's system of biomechanical analysis will soon become an important part of the curriculum and research goals at Philadelphia's Hahnemann Medical School. "There will be a whole new science center;" Ariel said with a slightly faraway look. "It will be so that the retarded and handicapped can be helped more than you can dream "
motion in any activity. Ariel's methods offer unlimited possibilities for rehabilitation, in the work environment in everyday settings as well as on Olympic playing fields. His industrial work isn't well known. "I get paid for it, so I'm not free to talk about it;' he said. Yet he has reorganized factory activities-how workers use tools, for example. He's helped improve toys and bicycles, tennis rackets and basketballs. He's put his Coto Research (and Amherst) labs to work for better dental equipment, mattresses and even prosthetics. The "flak" jacket that football players wear is partly his innovation. For injuries, disabilities and rehabilitation, Ariel's computers at the Coto Center and biomechanical analysis offer revolutionary standards of measurement. Using video films, electromyeography, a force platform, a fantastic, complicated computer tool called a "Digitizer" plus variable resistance machines (and his programs), nothing is left to guesswork. Loss of function is pinpointed in any individual in various ways. The EMG shows deviant patterns. Aerobic capacity and pulse rate measurements may sound alarms. A muscle group may decelerate instead of accelerate during a motion. The variables are countless. Angles, forces, velocities, displacement,. .. all are there. Dany Saar, Ariel's mainstay at Coto center along with Ann Penny, explains: "An injury shows up in various ways on both skills and strength tests. A very slight break in range of motion, one that the human eye could never see, shows up on the computer. And since every muscle group is tested, it all shows "
The only thing that is missing, for now, is the kind of ligament or fascia inflammation or weakness that manipulators find with their hands, often before translated into injury or loss of strength or motion. ENG ',,ors art' attached to Mickeij Louis' arm to tea! for various co?upo?ieuts of muscleRuction. Because the testing includes immediate computer analysis, further testing can be highly specific and swift, again producing immediate answers. a problem. Dany said: "It's crucial to know how and when a muscle contracts during motion." Weaknesses or inconsistencies during a contraction offer important clues to injury or spasm. When this is combined with the stick figure motion, it's relatively simple to zero in on the trouble spot. By its nature, this kind of study cannot draw from any body of standards. Ariel explained: "There are no standards. There cannot be. Standards mean an average. But nobody is average. Everyone is different in different areas of their bodies. This is why we say we want each person to be a Gold Medal winner in their own body." While there aren't standards in the usual sense, Ariel did garner a wealth of information about the human body that was developed by NASA while learning how humans might fare in space travel. To that, he added his own studies and other information about what the best athletes can do. "We learn from the top-of-the line people. Then, perhaps, we can apply what we learn to people at the bottom of the line and help everyone to move better." Along with the work with the Special Olympics (for disabled people) this entire body of information helps Ariel in his work creating better prosthetics. "By learning how normal people move, we show how to build prosthetics so they work better, so they are easier for people to use, so they are balanced, comfortable, and so they simulate natural motion;' he explained. Giving Coto a new thrust in its work with the disabled will be a major project with a new school of biomechanics at the Hahnemann Medical School, Philadelphia. This is in keeping with Ariel's changing goal to develop Coto as a concept.. center, enabling him to explore new avenues. "As a concept center, we quantify movement of soft tissue, mainly muscle, while the computer analysis shows weak: ness, imbalances of muscle groups. We haven't yet moved into more specific soft tissue work, but the future will be much more about injury, pain and stress. This will be our work with Hahnemann. "We areri t working yet, either, in the capacity of making recommendations for healing of injury, other than exercises with weights, variable resistance machines and the like. An injured athlete may come here and be analyzed, but he has his own doctor to care for him by whatever method he chooses;' Ariel said. But Ariel worries: "Sometimes, it is a problem when we make recommendations, for rehabilitation, for training. . .and the individual doesn't do what we suggest. Ile may change his mind about his sport. Maybe he moves to Mexico. Or he just doesri t find someone to help him to make the change, to motivate him. "This can be very difficult and frustrating. We wish people could see what we see..". training and rehabilitation. It is simply the best. Everyone in the business knows it. After all, since it was Gideon Ariel's ideas that gave us variable resistance training machines, what could possibly be an improvement over his system? 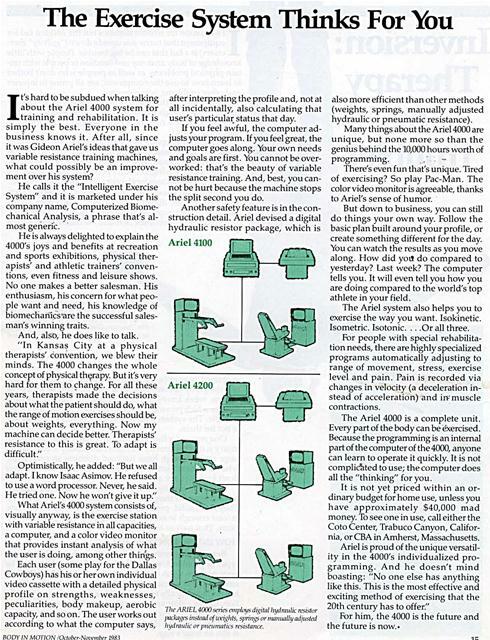 He calls it the "Intelligent Exercise System' and it is marketed under his company name, Computerized Biomechanical Analysis, a phrase that's almost generic. He is always delighted to explain the 4000's joys and benefits at recreation and sports exhibitions, physical therapists' and athletic trainers' conventions, even fitness and leisure shows. No one makes a better salesman. His enthusiasm, his concern for what people want and need, his knowledge of biomechanics,are the successful salesman's winning traits. And, also, he does like to talk. Optimistically, he added: "But we all adapt. I know Isaac Asimov. He refused to use a word processor. Never, he said. lie tried one. Now he wont give it up." What Ariel's 4000 system consists of, visually anyway, is the exercise station with variable resistance in all capacities, a computer, and a color video monitor that provides instant analysis of what the user is doing, among other things. after interpreting the profile and, not at all incidentally, also calculating that user's particular status that day. If you feel awful, the computer adjusts your program. If you feel great, the computer goes along. Your own needs and goals are first. You cannot be overworked: that's the beauty of variable resistance training. And, best, you cannot be hurt because the machine stops the split second you do. The ARIE!.40(X) series employs di,\ital hydraulic resistor i Jn: instenalofuv~:hts,spdrttisornuenua!lgadjusted hgdrandic or pneuntatics resistance. also more efficient than other methods (weights, springs, manually adjusted hydraulic or pneumatic resistance). Many things about the Ariel 4000 are unique, but none more so than the genius behind the 10,000 hours worth of programming. There's even fun that's unique. Tired of exercising? So play Pac-Man. The color video monitor is agreeable, thanks to Ariel's sense of humor. But down to business, you can still do things your own way. Follow the basic plan built around your profile, or create something different for the day. You can watch the results as you move along. How did you do compared to yesterday? Last week? The computer tells you. It will even tell you how you are doing compared to the world's top athlete in your field. The Ariel system also helps you to exercise the way you want. Isokinetic. Isometric. Isotonic....Or all three. For people with special rehabilitation needs, there are highly specialized programs automatically adjusting to range of movement, stress, exercise level and pain. Pain is recorded via changes in velocity (a deceleration instead of acceleration) and in:' muscle contractions. The Ariel 4000 is a complete unit. Every part of the body can be exercised. Because the programming is an internal part of the computer of the 4000, anyone can learn to operate it quickly. It is not complic`lted to use; the computer does all the "thinking" for you. It is not yet priced within an ordinary budget for home use, unless you have approximately $40,000 mad money. To see one in use, call either the Coto Center, Trabuco Canyon, California, or CBA in Amherst, Massachusetts. Ariel is proud of the unique versatility in the 4000's individualized programming. And he doesn't mind boasting: "No one else has anything like this. This is the most effective and exciting method of exercising that the 20th century has to offer." For him, the 4000 is the future and the future is now.. Generated on 4/20/2019 4:10:14 PM (PST) ADI/HQ/GBA/2019/ARIELCLOUD/v3.0.2018.0126.